DEBORAH CROMBIE: This has been such a fun week, not only reading the other REDs favorite posts from 2014, but going back through the months to find the blog I wanted to repost. This one was without doubt my favorite. We all love books with such passion. Sometimes those passions overlap and intersect, and sometimes we discover something entirely new. And sometimes we don't live up to our own expectations. I did what Hallie suggested in the original comments on this post--I printed the entire blog, with all our lovely Reds and readers suggestions, intending to read MANY of them. First, I bought A Winter's Tale to re-read, and it's still sitting in the to-read pile. Sigh. I didn't even get that far with many others I meant to explore. But, then, I have in this last year come across many new and completely unexpected treasures. I suppose there are worse things than an abundance of books to read! So how about you, REDs and readers? Was anyone inspired to read the mentioned books? And what new special books have you discovered since? DEBORAH CROMBIE ( from March, 2014): There are THOSE books. The books you read that you know as soon as you've read a few chapters, or even a few pages, are going to be books that you can't imagine NOT having read and that will forever be part of you in some indefinable way. We've talked before (more than once, as it's a subject obviously dear to our hearts) about books we read as children that impacted us profoundly, both as writers (for we who are writers) and as people. But what about books we've read as adults that we knew, instantly, were special? 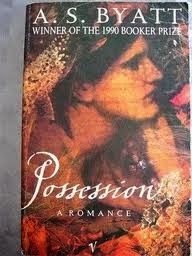 One of those for me was Possession by A.S. Byatt. For my daughter, Shadow of the Wind by Carlos Ruiz Zafon. These special books could be classics that we've just now got round to reading. Or something recommended by a friend, or a book review, put on a list or in a TBR pile and left to gather dust. And then one day, something brings it to mind, or you run out of things that you have to read (which for working writers, doesn't happen very often.) You pick up this book. You begin. Soon you know you will be seduced, transported, and changed. And you think, "How could I NOT have read this???" This happened to me recently with two novels by Connie Willis, Blackout and All Clear. Blackout was published in 2010, and was recommended to me by my friend Kate Charles. I thought, "Oh, sounds interesting," but somehow just never got around to picking it up. Then I saw another mention, somewhere, and thought, yes, I really must read that. I bought it (in paperback, thank goodness) started reading, and KNEW. 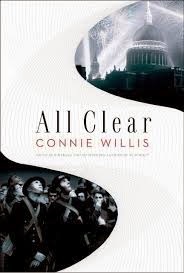 And everyone I talked to about this fabulous book said, "You haven't read Connie Willis???" Where had I been, behind a rock??? I soon discovered that Blackout and its sequel, All Clear (which won the Hugo and the Nebula and heaven knows what else, it's that good) were actually one very long novel. So be forewarned, if you haven't read these books, you should buy All Clear before you finish Blackout because you will HAVE to know how the story turns out and what happens to the characters (three time-traveling historians from 2060 Oxford who go back to WWII and get stuck in the Blitz.) I have still to read Willis's earlier time-traveling-Oxford-historians books, but I will. So, dear REDS, what have you read that you now can't imagine having NOT read? book is FABULOUS and I could read it a million times. 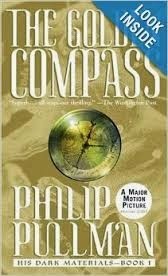 And I came late to Philip Pullman's amazing Golden Compass books--love them. Huh. Guess I am drawn to novels that cannot be made into successful movies. RHYS BOWEN: Debs, I'm also a huge fan of Possession, and have re-read it several times. Also adore Connie Willis. My latest find is Kate Morton. I loved her Forgotten Garden and The Secret Keeper. And Hank, I was also so impressed with The Winter's Tale. Not sure about seeing the movie. I found the movies of The Hobbit and The Lord of the Rings were disappointing. To me they didn't capture the flavor of the books, the whole concept of little people taking on tasks far beyond them, but still remaining their simple, loveable selves. HALLIE EPHRON: Great question. At the top of my list would be Audrey Niffenegger's The Time Traveler's Wife. Talk about a 12-hankie ending. And that's another book that did not translate well to the screen. Also Carol Shields's The Stone Diaries Anything by Barbara Pym (Excellent Women.) Olive Kitteridge. Women's fiction, all of them. One of my favorite books in the entire world is The Golden Compass by Phillip Pullman, part of the trilogy His Dark Materials. The movie should have been fantastic — it had a huge budget, big stars, great special effects — and yet, alas, wasn't. Sometimes things are just better in your head than on the screen. JULIA SPENCER-FLEMING: I've long waved the flag for the fabulous Lois McMaster Bujold, whose Vorkosigan series is both a fabulous read and a master class in blending genres - just writes science fiction interwoven with mystery/romance/comedy of manners, all populated by the most real characters ever. No signs of a movie for these books, alas, although Vorkosiverse fen (plural of fans for the non-skiffy among us) are very excited about the possibility of the talented and hunky Peter Dinklage as the hero, Miles Vorkosigan. It is interesting how some of the best books don't translate well onto the screen, isn't it? And when I think of movies that have improved on the book, the book is invariably almost unreadable:Last of the Mohican's, Bridges of Madison County, etc. DEBS: I never ceased to be amazed by the things that we seven diverse writers (and readers) have in common. 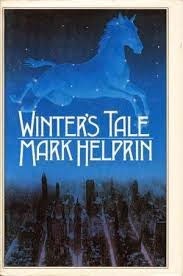 Hank, I was thinking about how much you love A Winter's Tale when I wrote the intro to this post. Do you know that I read it when it was first published, and can you believe it's been forty years??? I had a hardcover copy, which disappeared, sadly, in some book purge or other. I've just now bought the paperback, which should be easier to read, weight wise:-) I hope I can time find to re-read it. Hallie, I LOVED The Time Traveler's Wife. The movie--yuck. Phillip Pullman's His Dark Materials trilogy is up there, too, but it has a very special and weird emotional place for me. When I was stranded in London the week after 9/11, no phone, no internet, no contact with family or friends in the US. I bought a copy of The Golden Compass. Then the next two books. I read non-stop. Those books were what got me through that week. Julia, I got to read a Vorkosigan book in manuscript as a first reader! How cool is that? They are wonderful, and one day (some day...) I'm going to read the series straight through. And then somehow this discussion morphed into books that did or didn't translate to the screen, but I think that is a whole other blog! Or two. Or three! So, READERS, what books have you come across, perhaps unexpectedly, that have impacted you so profoundly that you can't imagine having NOT read them? Wishing all the Reds and the "blogging crew" all the best in the new year. I had already read "Blackout" and "All Clear" when this was posted . . .
My latest can't-imagine-not-having-read book is Michel Faber's incredible "The Book of Strange New Things." 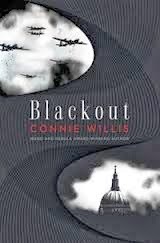 I remember being so excited when I saw two of my favorite books featured in this post, Blackout and All Clear by Connie Willis. I strongly encourage reading Willis' Doomsday Book and To Say Nothing of the Dog, which are the first two books featuring the time traveling historians. There are also some short stories with them. My book from 2014, after that post, that would have gotten away from me if Sujata Massey had not been a guest here on the blog was The Sleeping Dictionary. I loved it and have recommended it to lots of people. Debs, I was getting ready to head over to Oxford when 9/11 happened, and I read Phillip Pullman's His Dark Materials trilogy, too. Three of my friends decided not to go to England then, but I thought it would be the safest time. Everyone was on high alert. When I got there I felt like I was at home. Probably in a different way than you have described regarding your attachment to England. But maybe not. I don't think it was just reading the books. It was a good fit. I didn't want to leave. Some time after I got back I discovered Lyra's Oxford and experienced reading it as a very special gift. It was the one book I had at that time that I could hold open and read. The physical book became precious to me for that reason. I loved it. It's the only book I feel a physical connection to. Blogger and I are NOT getting along, so I'm going to try this one more time. I remember this post. Loved it the first time and loving it again. And I'm absolutely certain the book I mentioned as my can't imagine not having read was Ann Fairbairn's "Five Smooth Stones," and it remains the single most transformative novel I've ever read. Other can't imagine not having read are Carlos Ruiz Zafon's novels which I find myself reading aloud just for the simple pleasure of hearing the enormously moving beauty of his words. The most recent book to fall in this category is very recent. I was given an electronic arc of THE GIVEN WORLD by Marian Palaia. I almost passed on it as it most definitely did not sound like my cup of tea. Whoa. I am forever grateful I read those first couple of paragraphs which were enough to keep me reading and sad to have it end. When it's released this year, do grab it! Happy New Year! Hope 2015 is good to all. I resisted reading THE HUNGER GAMES because I think over-hyped books are not going to be good. They're ... over-hyped. I read THE HUNGER GAMES in August 2011 (I have a little black book to keep track) and I DEVOURED all three books in four days. I have since re-read them more than once in some cases. The movies? S'alright. I like that time before any movie comes out when you have your own picture in your mind of who and what things look like. Afterward, the celebrities are pretty much forever in your brain as these characters. The casting was good in these movies except for Peeta. And these books are particularly difficult to adapt being first person POV. I have to keep them as separate entities, the books and the movies. I read (or, more accurately, read again) TRUE GRIT by Charles Porter. On the one hand, it seemed dated. On the other hand, how he managed to include history, politics, and morality without it coming off as author intrusion was impressive. I think Mattie Ross is a great character, very American. Has anyone read Connie Willis' LINCOLN'S DREAMS? I was enthralled by it, long ago. Loved this blog, Debs. The books I can't imaging having NOT read: The Wizard of Oz (the original; tornado goes off in first chapter; no farmhands) and Eloise and Anne of Green Gables. More recently, all of the Harry Potters and I agree on the Hunger Games. I'm still a sucker for a great YA novel. I agree,Reine...The Golden Compass--I bet I think about it every day. I'm rereading a lot of Sherlock Holmes now...wonder how that'll be! Happy new year, fabulous ones! I forgot to say Happy New Year!!! Happy New Year, everyone! Kathy Reel, I bought Sujata's The Sleeping Dictionary but haven't read it yet. It got buried. Will move it to the top of the pile. This year I really am going to keep a list this year--there's a resolution for you. Hallie, I feel the same way about the Harry Potter books. Can't imagine not having read them. And reread them. I love the movies, too, but, as PK says, they are different entities. Haven't read The Hunger Games, but will, because I, too, am a sucker for good YA. Good YA novels transcend the genre, just like good mysteries. Debs, please let me know when you've read The Sleeping Dictionary. I think you'll love it, but I always enjoy others' takes on favorite books. When I look back over my reading history, it's those books that Kaye described as not seeming like my "cup of tea" and turning out to be blockbusters of my reading life that resonate so loudly. The Girls by Lori Lansens was a book that taught me to give those books a chance. The Girls is about conjoined twins who work in the local library, and I didn't think that conjoined twins would translate into a very lively story. All I can say now is that the book showed me how extraordinary the ordinary can be and how ordinary the extraordinary can be. Another powerful read for me was one from some time ago. Stones from the River by Ursula Hegi, and it also involves a person of unusual physical stature, Trudi Montag who is a dwarf in the small (fictional) German town of Burgdorf from 1915 - 1951. A riveting read. And, yes it seems I have a pattern here of books that prove the abnormal is much more than what initially appears to the eye. Of course, I don't know how I would have lived without Harry Potter, shared by my son and me. And To Kill a Mockingbird and Fahrenheit 451 and so many more. And, 2012 was the year when I discovered the Reds, who might have gotten away if I wasn't preparing to attend Bouchercon in Albany that year. When I looked at the author list of attendees and saw what they wrote, I knew that I had missed out on some great mystery series, and so began a reading frenzy that resulted in one of, if not the, best reading years of my life. Happy New Year everyone and may 2015 bring you great writing and reading! As I'm attending this year's Bouchercon in Raleigh, I have lots of reading to do that will probably result in some more ones that could have gotten away. Good "morning," all. Happy New Year! I resolve to go to bed earlier and get going earlier. I have a lot to do now and can't do it while I'm watching Downton. My choices aren't unique, but they are so much a part of me. Anne of Green Gables ( actually the whole series) and To Kill a Mockingbird. I taught Mockingbird to 2 or 3 classes a year for 33 years and I never got tired of it. Atticus is my hero.